There’s a lot you don’t know about Prince Charming. Rejected by their princesses and cast out of their castles, Liam, Frederic, Duncan, and Gustav stumble upon an evil plot that could endanger each of their kingdoms. Now it's up to them to triumph over their various shortcomings, take on trolls, bandits, dragons, witches, and other associated terrors to become the heroes no one ever thought they could be. Four imperfect princes. Five audacious princesses. One hilariously unforgettable adventure. 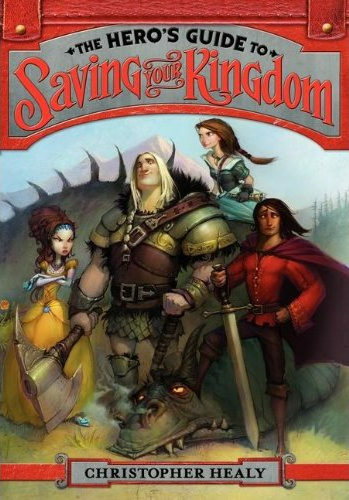 The Hero’s Guide to Saving Your Kingdom is Volume I of the Hero’s Guide Saga. Volume II will be published in May 2013. Who’s a hero, who’s a wannabe hero, and who’s definitely not a hero? Here’s where you can get to know the denizens of the Hero’s Guide universe. Planning a vacation to Sturmhagen? Better bring your troll repellent. 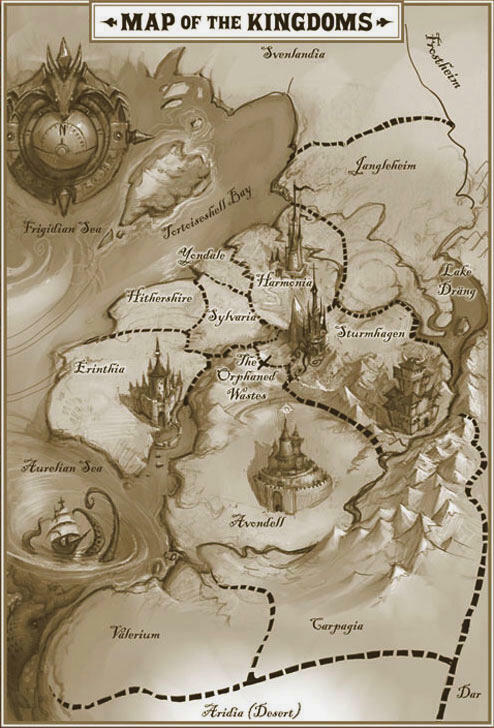 Click on the map or the buttons below to learn more about the many kingdoms of The Hero’s Guide to Saving Your Kingdom. Known for: Vast and dense pine forests, plentiful roaming monsters (especially trolls), lots of fur trim. Castle Sturmhagen: Enormous stone-faced home to the kingdom’s royal family, including all seventeen crown princes. The Bandit King’s Castle: Tucked away somewhere in the thick woods of Sturmhagen lies the small (for a castle) headquarters of the notorious Bandit King. Flargstagg: A quaint and picturesque village with a dark side. The Wrong Side of Flargstagg — a grimy, dangerous, shadow-filled place — is where you will find the Stumpy Boarhound, just about the worst tavern in all of creation. Nightkill Mountains: These jagged peaks, the tallest of which is Mt. Batwing, form the border between Sturmhagen and the Orphaned Wastes to its west. Whoever named them obviously didn’t think much of them. Known for: A sophisticated and well-mannered populace, the safest streets of any known kingdom, and the best tea service you’re going to find anywhere. Harmonia Palace: A refined piece of architectural beauty, site of many gala balls and banquet dinners. Muffington Hamlet: A cosmopolitan village not far from the palace, an excellent place to find a silversmith, lace-maker, messenger service, poodle breeder, or any other shops or businesses you may require. Known for: Adorably picturesque forests, a surplus of pettable wildlife, the least popular ruling family in the world. Castlevaria: An awkwardly designed structure containing no fewer than five “bouncing rooms.” Home to the Sylvarian royal family, Castlevaria is often empty of all except those who have no choice but to live there. Snow White’s estate: Formerly the home of a band of Sylvarian dwarfs, the estate now houses Prince Duncan and his bride Snow White. The house has a large gated garden and hosts regular flute concerts. Known for: More parades, festivals, and celebrations than you’d think any one kingdom would be capable of hosting; the Cross-Duchy science fair; excellent butter sculptures. Palace Erinth: A gloriously over-decorated structure, showing off not just the skill and craftsmanship of Erinthia’s artists and architects, but also showing off just about every ounce of gold and jewels the royal family could get their hands on. Caledonia Forest: Beautiful, but rife with bandits. Starling Lake: Beautiful, but rife with wet bandits. Known for: A vast network of gold mines running beneath its surface; well-trimmed hedges; harsh prison sentences. Avondell Palace: The grand and stunning home of the Avondellian royal family. The palace grounds house a world-renowned rose garden and an entire menagerie of animal shaped shrubs and hedges. The Glistening Peaks: The mountain range which forms Avondell’s eastern border with the Orphaned Wastes is actually quite dull, gray, and lifeless. The “glistening” refers to the precious metals found in the earth below those peaks. Known for: Being a relatively small and dead piece of barren land, which no kingdom has ever seen fit to claim. Mount Batwing: The great curved peak that rises high above the Wastes to the east. Zaubera’s fortress: Creepy and insanely designed, this enormous stronghold is highlighted by its two-hundred foot tall observatory tower and the eerie purple vines that cover the outside of the edifice. Known for: Brutal climates (like searing deserts and frigid icy tundra), brutal creatures (like ice wraiths, giant sandsnakes, bladejaw eels, scorpiogres), and even more brutal people (like Lord Rundark). • Ruins of the Temple of Gorgranth: A lure for treasure hunters, these ruins are filled with just as many deady booby-traps as they are priceless artifacts. It is the supposed resting place of the golden Duck of Destiny. Hocksnath: A village that was leveled to the ground simply because its people were not fond of facial hair. Cave of the Bone Moles: It’s a cave full of bone moles. You wouldn’t like it. Click here for a downloadable Hero’s Guide activity guide from HarperCollins. First there's this:"Christopher Healy--author of The Hero's Guide to Saving Your Kingdom--is coming to Green Bean Books on October 13th at 2 PM! He'll read from and talk about his book and we'll be raffling off a "Hero's Guide to Portland" gift basket w. gift cards and merchandise from local Alberta Street stores!!!" And then on Sunday, it's Wordstock Festival time! Welcome to OfficialHerosGuide.com, the official website of the Hero’s Guide book series by Christopher Healy. Check out the Who’s Who page for incredibly interesting and terribly important facts about all the heroes, villains, and in-betweens of The Hero’s Guide to Saving Your Kingdom (including stuff that’s not in the book!). Then take a tour of their kingdoms on the interactive map page. And check back here for big news about Hero’s Guide — like the fact that Book 2: The Hero’s Guide to Storming the Castle comes out on May 1st, 2013! And also that the Princes Charming may be hitting the big screen! Film rights to Hero’s Guide have been optioned by Fox Animation and Blue Sky Studios, the people behind the Ice Age movies! Stay posted for updates. Before delving into Fairy Tale Land to write The Hero's Guide to Saving Your Kingdom, Christopher Healy held numerous other jobs, including actor, ad copywriter, toy store display designer, fact-checker, dishwasher, journalist, costume shop clothing-stitcher, children's entertainment reviewer, and haunted house zombie (though not in that order). Check out ChristopherHealy.com for more news from the author or to drop him a line. He commutes to Fairy Tale Land from his home in New Jersey (not too, too far from where he grew up in New York City), where he lives with his wife, two children, and a very annoying cat. The Hero's Guide series is his first work of fiction. Todd was raised in abject poverty. His parents couldn't afford to buy him toys. Don't feel bad for him, though. His meager upbringing meant Todd had to create his own toys and entertainment. He was always drawing fantastical stories and creatures and building toys from discarded objects (in other words, garbage). One year some kind, charitable neighbors dropped off Christmas gifts for his family. Todd finally had toys! He didn't understand how to play with them, though, so he smashed them and created his own toys. This thoroughly concerned his parents. These experiences helped to fuel Todd's imagination and he's grateful he's been able to make a living from being creative. Besides his passionate love for art and creativity, Todd is an astronomy enthusiast. He steps out onto his balcony every night to see if Betelgeuse has gone supernova yet. He also loves the beach, redwood trees, Toblerone chocolate, aliens, his children, and his beautiful wife. He resides in Los Angeles. He also refers to his brain in third person. Here’s what readers and reviewers (who are so much better than those lousy bards!) 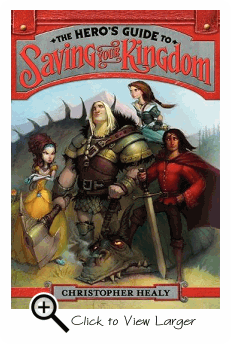 are saying about The Hero’s Guide to Saving Your Kingdom.